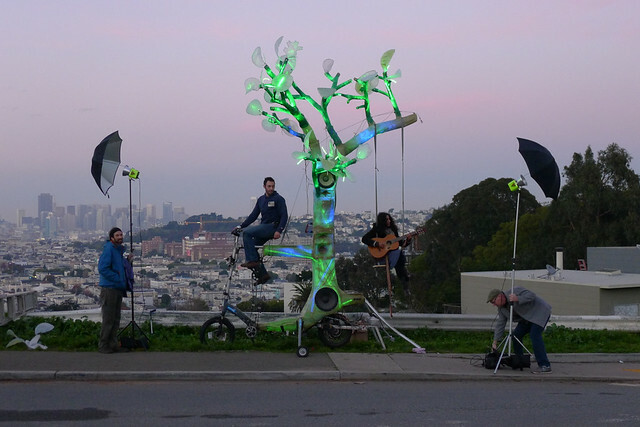 This custom art bike, made and based in San Francisco, rides through the city at 12 feet tall, then sprouts roots, branches, and leaves at events, where it becomes a 2500-Watt double-stack main speaker at our Pedal Powered Stage. Integrated LEDs look stunning at night. 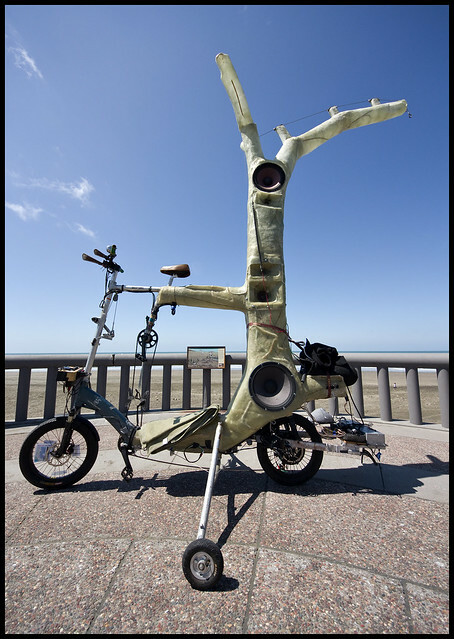 The Tree has two seats and creates all of its own power using an integrated One Bike / One Speaker circuit. 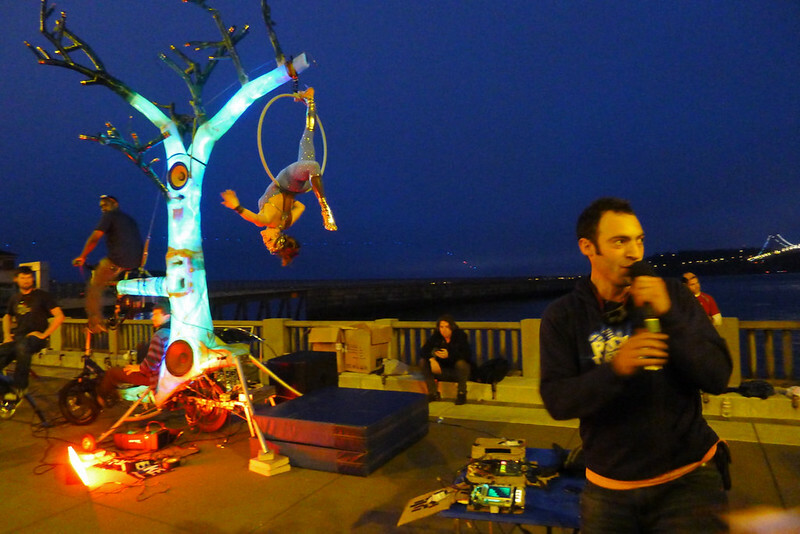 Above, El Arbol in action at a 2014 San Francisco Solstice ride. Aerialist Shredder performs on hoop from El Arbol’s trusty rear branch. SF Marathon. El Arbol + 1 sub is capable of entertaining 1000 people. El Arbol without its Canopy of Leaves.The sound quality is incredible. By using the audio elements from 2 Modified JBL PRX loudspeakers, it has the ability to get music out at festival levels with very low distortion. 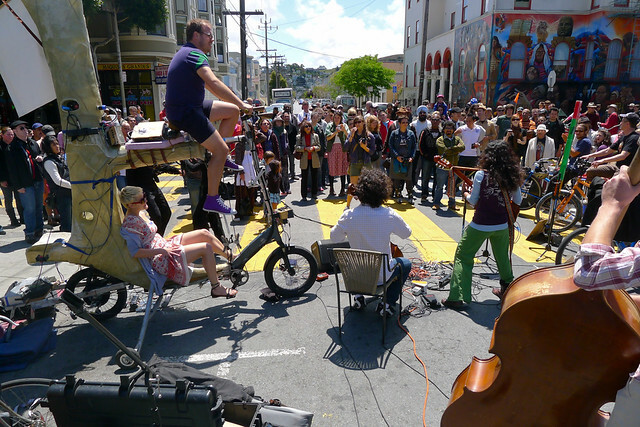 We use El Arbol as half of our Pedal Powered Stage at the San Francisco Bicycle Music Festival. The height of the upper loudspeaker (9′ up!) helps the sound spread out easily out above a crowd, without requiring deafening volume levels for those in the front. It’s fun and expands the notion of ‘Stage’ to include the pedalers. See the online build log to learn how it was made. 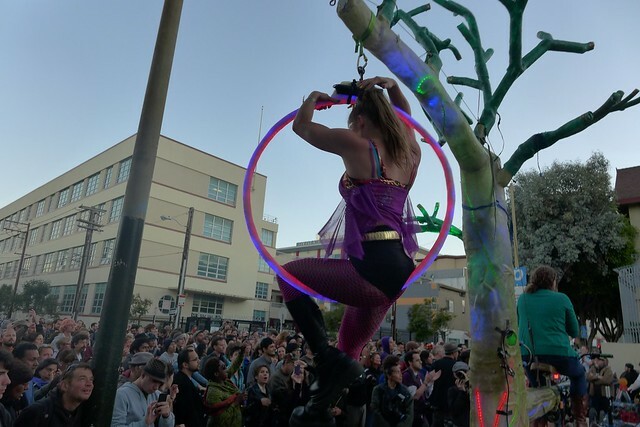 Anyone can climb up El Arbol and pedal to generate power for the music at events. It’s one of the best seats in the house! Above, Rupa and the April Fishes perform at Sunday Streets. 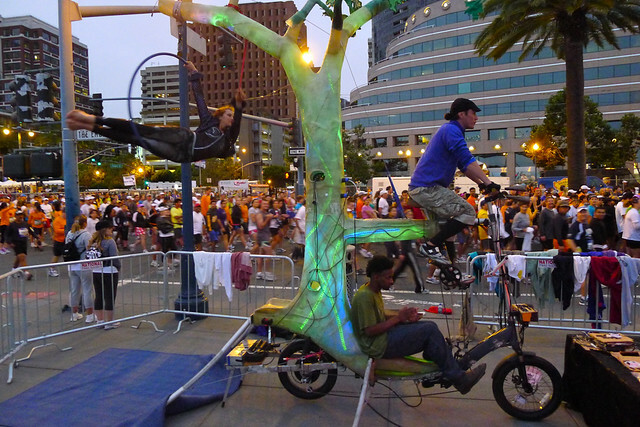 El Arbol is part of our Full Pedal Powered Stage. It is also available as a standalone Sound System or interactive light sculpture. A natural landmark at events, you can build it into your event map. 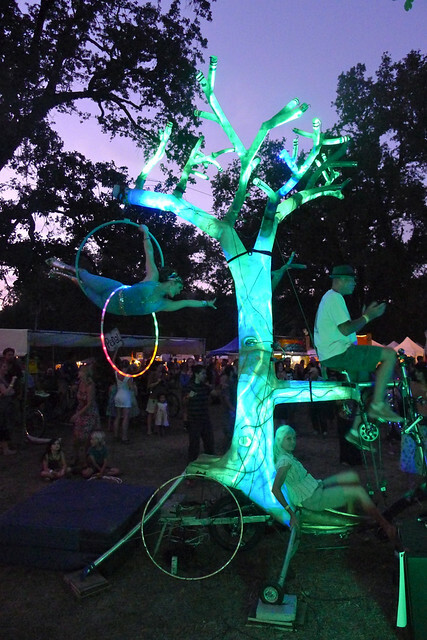 At Gaia Fest in 2012, the organizers collaborated with Rock The Bike to create a music stage called “El Arbol Stage”. Aerial dance performances require a separate budget. Advance notice recommended as there are very few dancers in our community who are trained and approved to perform on El Arbol. New for 2013: Shredder performs on a beautiful Glass Hoop, first of its kind. Stunning at Sunset! El Arbol can travel, but it has never left the West Coast.